The following article is the first part of a series about workers' conditions and disputes at Amazon and other online-retail companies. If comrades in the UK are up for turning this material into leaflets for distribution amongst Amazon workers here, please drop us a line! The disputes in Pune and Mumbai are expressions of the fragile nature of India’s ‘start-up bubble’, the share-inflation based boom of retail and service companies, which use both new technologies, like mobile phone apps, and cheap labour for their business success. The fragility is both external and internal. Externally, the recent jitters that went through the stock market in China can be seen as a sign towards the brick-wall that the model of ‘non-profitable’ share-inflation based expansion a la Amazon is about to hit. Internally, the discontent of workers within the newly developed software departments, warehouse clusters and delivery networks rips apart the facade of the sanitised and effortless world of online services. We spent some time talking to warehouse workers of different ‘e-commerce-retailers’ (Amazon, Flipkart, Myntra) in the outskirts of Delhi. Before looking at the conditions of Amazon workers and their colleagues we give a broad overview about the e-commerce and retail sector in India. The retail and trading sector in India plays a major role in terms of stabilising a society that is being deeply shaken by the rapid process of proletarianisation: the death of the peasantry and increased rural poverty on one side, slum cities and a lack of urban/industrial jobs on the other. Impoverished masses enter small-scale trading, e.g. as street hawkers or small shop owners. Their small-scale business is connected to a trading class, which has held their positions as middle-men often for several generations and managed to become a strong political lobby, largely, but not exclusively, represented by the ‘Hindu-nationalist’ BJP. The state is in a difficult position given that the trading sector is, on one hand, a social container for large-scale un- and underemployment, but, on the other hand, the sector is very under-developed and starved of capital for, e.g. investment in logistics infrastructure, modern cold-storage, retail supermarkets etc. The under-development of the retail and logistics sector has its negative feedbacks into the production spheres and industries, the circulation of commodities and the realisation of their value takes too much time, e.g. the truck-journey from Maruti Suzuki – India’s biggest car plant near Delhi – to the export port in Mumbai takes up to eight days and results in substantial losses through damaging of the transported cars along the way. Up to now the state in India has limited foreign-direct investment in the retail sector to 49 per cent, meaning that big corporations like Walmart, Amazon or Carrefour have not been able to act as ‘independent’ retailers. This political decision was made less due to mere protectionism of the rich established local traders, but mainly because of the fear of what kind of social repercussions a rapid concentration process in the retail sector would have on the millions of poor traders. In the US, an already highly concentrated retail region, Amazon is said to be responsible for 200,000 job losses in smaller retail shops and companies during recent years. In India, one expression of the social tension within peasantry and traders were the ‘Patel’ riots in Gujarat in August 2015, when tens of thousands of ‘lower middle-class’ people, fearing social degradation, protested. This led to clashes with the police and seven people being killed. The general economic crisis and lack of funds increasingly pushes the BJP government to open the sector for ‘industrialisation’, funded by capital from around the world. Currently one of the main forms this funding takes is the so-called ‘e-commerce bubble’. Basically e-commerce companies like Amazon, Alibaba or Ebay provide an internet platform or apps for suppliers and buyers, and organise how the commodities get from those who sell them to those who buy them. They take a transaction fee, which is their profit. If we believe the hype of those who claim that we live in an ‘information society’ of immaterial networks, then e-commerce and the internet would create an ideal virtual and decentralised marketplace of manufacturers of goods or providers of services on one side and owners of internet-able mobile phones who want to buy their stuff on the other. The connection between them would theoretically be direct and non-hierarchical. Instead we witness a massive concentration and centralisation process: e-commerce companies like Amazon and Alibaba or e-service companies like Uber become extremely huge central powers, (co-)commanding the labour of millions. In the case of Alibaba, the company’s sales on the site account for 12 per cent of China’s total retail market, Alibaba has 367 million active buyers, more than the population of the US and Canada combined, and fulfils an average of 30 million orders daily, nearly double the volume of the shipping leader, UPS. *** How can we explain the concentration process? First of all, the internet is not as immaterial and non-hierarchical as people might think. To set-up and maintain global software platforms requires many workers, Amazon employs thousands of IT workers in office towers around the globe. The organisation of a modern logistics network requires not just know-how, but command over warehouses, supply-chains and delivery workers, too. This ‘material backbone’ of the e-commerce companies alone would not be able to explain the rapid centralisation process. It is the intertwinement of this material logistical backbone and the aggressive trading of goods through discounting with the expansion of the companies on the financial market, e.g. in form of shareholdings. b) Amazon in India (like Alibaba in China) acts like a bank. They grant credits to selected suppliers and manufacturers, which would face difficulties or long bureaucratic processes on the general banking market. Amazon then subtracts the credit repayment from future transactions. In India, Amazon have issued 64 billion USD credit to smaller vendors since 2011, offering 3 to 6-month loans of between 1,000 and 600,000 USD – around 40 per cent of Amazon site sales are through third-party sellers, who are also potential credit clients. Amazon’s also offers selected local manufacturers from India the chance to enter the global export market through the Amazon online-platform (“Global Selling Program”), something which would be difficult to achieve as independent suppliers without global connections. Both the credit and export connection result in a long-term dependency of the suppliers on the e-retail companies. We witnessed a similar process in the retail sector in the UK, where companies like Tesco entered the real estate market and shackled their (food) suppliers through cut-throat financial contracts.This is the rough background to the massive centralisation process – and its internal contradictions are clearly visible, both in terms of the instability of the stock market-based expansion and in terms of emerging workers’ power, which goes hand in hand with material concentration processes. Indeed, share-value is enormous (Flipkart is valued at 11 to 15 billion USD), the sales volume is considerable (Flipkart sold goods for 7 to 8 billion USD in 2014-15), but officially the three major e-commerce companies Amazon, Flipkart and Snapdeal all ran losses in 2014, between 30 and 60 million USD (other sources put the losses at a higher level: Flipkart is said to be losing Rs 2.23 for every Rs 1 of revenue, Amazon loses Rs 1.90 and Snapdeal Rs 1.72, according to Trak.in). This is not an aspect limited to India or the ‘start-up’ phase of e-commerce: In the UK the internet retailer Asos’s share price went down by two-thirds in 2014, the online supermarket Ocado is yet to post an annual profit despite launching in 2000, and Amazon’s market value shrank by a quarter in 2014. The company posted a third quarter (2014) loss of 437 million USD (£290 million), despite sale rising 20 per cent to 20.6 billion USD. A similar situation exists in the wider ‘info-tech-sector’: AirBnB and Uber, valued at 26 billion USD and 41 billion USD respectively, have raised over 8 billion USD in funds respectively, without yet actually making a profit for their investors. Pinterest, WhatsApp, Snapchat, and Instagram have been valued at 11 billion USD, 19 billion USD, 20 billion USD, and 35 billion USD respectively – and yet none have any source of income. These losses can only partly be explained by tax avoidance strategies, but rather more so by the peculiar ‘price-war’ of modern retail: expand through gambles and ruin your competitors in hope for future monopoly profits. The official losses don’t mean that a few people don’t get rich: in 2015 Flipkart’s founders Sachin Bansal and Binny Bansal made their debut on the Forbes India Rich List at No. 86 with a net worth of 1.3 billion USD each. Although the growth rates of e-commerce sales are considerable, the total volume is still modest. The Indian e-commerce industry is still only a fraction of the Chinese market (460 billion USD) – which promises future market expansions and attracts capital from all over the globe. In March 2015 the Chinese e-commerce giant Alibaba offered 5 billion USD for the Indian’s second biggest e-retailer company Snapdeal, but the deal failed, because Snapdeal’s main shareholders expected at least 7 billion USD. The inter-connection of e-commerce companies in India with Alibaba would link them directly to the shaky conditions on the Chinese stock market: in the aftermath of the Chinese stock market crash, a financial wing of the Alibaba corporation came under state scrutiny for having helped unofficial lending companies to loan significant sums of ‘grey-market’ money to investors for stock market speculation. Alibaba now enters the Indian market via e-commerce subsidiary Paytm. In August 2015 Paytm was granted provisional approval by the Reserve Bank of India to offer a wide array of financial services, e.g. debit cards, savings accounts, online banking and transfers – a further global integration of the financial and retail sector. The e-commerce companies link up with a selected few of the smaller shop owners. This is less due to tax and FDI policies (the e-commerce companies are not supposed to be ‘retailers’, meaning, owners of the commodities themselves), but more so in order to save investment in storage space. This can also be seen as a political act to appeal to the representatives of small traders and their lobby who benefit, in the short run at least. For example, a medium-size grocery store in Gurgaon (Milano Mart) has been featured in the media because its sales are supposed to have increase by 20 per cent in three months of partnering with two start-ups – PepperTap and Grofers. PepperTap, a Gurgaon-based “hyper local grocery service” offers delivery within two hours. PepperTap, which connects the neighbourhood grocery store to the nearby customers, earns a commission on every transaction. The company does not have its own inventory. It hires and trains manpower, which is deployed at ‘partner stores’ in each location. These people get the orders on their mobile devices, collect the supplies from the partner stores and deliver to the consumers. In the short-run the start-up companies save investment in expensive storage space in congested Delhi, but in the long run it is more likely that these small traders will lose out in cost comparison with more sophisticated storage and supply-chains. Representatives of the bigger traditional retail companies criticise the e-commerce companies and their business model: on one hand, the e-commerce supply-chain depends on smaller local traders, on the other hand the price competition will bankrupt these traders in the long run. They also criticise the fact that foreign direct investment (FDI) in retail is limited, while e-commerce companies can obtain 100 per cent FDI by formally acting as service companies. The boss of the major retail Future Group Biyani said: “The growth of virtual retail […] is entirely led through reducing the prices of products that are subsidised by the investments made by foreign private equity funds and venture capitalists. On the other hand, retailers in the real world face severe restrictions on fundraising, especially when it comes to foreign funds, whether through external commercial borrowings or through equity.” Amazon lobbies to change FDI rules that preclude the company from selling goods directly to Indian customers. That change would clearly benefit Amazon, but would mean possible bankruptcy for Amazon’s current ‘clients’. For example, the camera equipment company, Fotocolor, gives Amazon 6 percent of every sale on the site: “If Amazon were allowed to sell directly to customers”, Fotocolor’s boss Nichani says, “Fotocolor wouldn’t be able to compete”. More substantial for global capital is not the integration of small traders, but the vast pool of cheap labour in India. Many e-commerce or e-service companies try to enter the market of ‘personal services’, e.g. of domestic cooks and cleaners, drivers and couriers. For example, Uber Technologies Inc plans to invest 1 billion USD in India 2015. According to the Financial Times newspaper, Uber hopes that the investment would enable the company to reach 1 million daily journeys in India. Estimates put the number of current Uber journeys in India at 200,000 per day. Companies like Flipkart are trying to integrate the elaborate logistics structure of the famous ‘dabbawallas’, Mumbai’s lunchbox delivery men. This personal delivery service of home-cooked food for office staff was founded in 1890 and is based on a patriarchal hiring system from certain rural regions of Maharashtra. Today 5,000 low-paid dabbawallas serve 200,000 customers in Mumbai. They pick up the food from clients’ houses, sort the deliveries nearby at big railway junctions and deliver the food to the clients’ respective workplaces, using a simple, but effective coding system that does not involve a single computer. This involves 400,000 transactions per day (including the return of empty tiffin carriers) with an error rate of 1 in 16 million transactions. This high rate of dependability earned the dabbawallas a six sigma designation and an ISO 9001 accreditation. The structure of the dabbawallas is hierarchical and a type of closed-shop system. Since 1890 they’ve only been on strike once, in 2011, when the bosses of the association called a one-day work-stoppage in support of the political leader Anna Hazare. It is not surprising that Richard Branson, Flipkart and other companies want to tap into this traditional patriarchal system of low-paid work, which, over decades of experience, has managed to develop an intricate logistical structure, and to siphon it off via modern technology and retail circulation. Under the deal with Flipkart made in early 2015, dabbawallas will make deliveries assigned from a Flipkart hub while collecting hot meals from customers’ homes. Flipkart said the dabbawallas had undergone training at the company’s delivery centres and “would start with a paper-based tracking system, moving on to apps and wearable technology”. We can now see how these central e-commerce companies function via trade and credit relations as a link between global financial markets and thousands of small traders, manufacturers and service workers. In India 30,000 small traders and manufacturers sell their goods through the Amazon web portal – which offers 25 million different items. Snapdeal sells goods of 150,000 merchants. Some of the 12 million different items are produced by entrepreneurs in one of the world’s largest slums, the Dharavi neighborhood in Mumbai. If we take into account the loss-making price-war, which basically requires greater and greater sums of global credit money, we can make out the scope of this wager on future profits – and we can imagine the impact of a possible crash on thousands of smaller economic units. The future of e-commerce in India is hyped by referring to the massive increase of mobile-phone based internet access. The number of mobile internet users in India is expected to reach 213 million by June 2015. There were 173 million mobile Internet users in India in December 2014. Flipkart says that 75 – 80 per cent of internet orders come from mobile phone apps and decided to shut down its general internet portal and reduce its communication solely to mobile apps. The significant share of mobile phones also indicates that, e.g. home internet is rare because of shoddy housing, frequent power cuts etc. and hints at a deeper structural problem for the future expansion of e-commerce: the limited purchasing power in India. At 1,500 USD, India’s per capita income is less than a quarter that of China’s 6,800 USD. Working class wages have been declining since 2009. The scope for the massive expansion upon which the price-war is betting seems limited. Apart from the decline in purchasing power of the working masses, another future problem lies in the under-developed logistical infrastructure, both of the e-commerce companies and the general transport infrastructure. When we tried to meet warehouse workers in Delhi we decided to visit the Flipkart warehouse for India’s biggest state Uttar Pradesh. The internet told us that it was located close to Delhi, near Gaziabad. We expected a huge warehouse near the main highway, but at the highway bus stop people pointed down a village road. In the end it turned out that the Flipkart was an old village store-house, filled up to the brim with mobile phones and other gadgets. Tiny vans with hand-painted DHL signs on them stood in front of the ‘warehouse’, where around 60 young workers are employed. This warehouse features as a central logistical node on the Flipkart portofolio. Some weeks later we stood in front of the main Flipkart warehouse near Gurgaon/Manesar, where over 1,000 workers are employed, but although the warehouse itself was modern, the company has not bothered to tarmac the dirt track leading to it since its opening four years ago. These might just be random impressions, but nevertheless they are expressions of something more substantial: the lack of investment in infrastructure by state and capital. The conditions of rail and port structures look similar: rail transport costs in India are supposed to be 70 per cent more expensive than in the US. 90 per cent of India’s international trade goes through ports, but the capacity utilization in big ports is only 72 per cent. They handle 10 million containers per year, compared to 140 million in China’s main ports. The state is in a fix: attracting FDI and increasing tax revenue seems mutually exclusive, e.g. Gurgaon-based e-commerce company, Grofers, decided to shift headquarters from India to Singapore, following the main e-commerce company Flipkart. The official explanation is that the corporate tax rate is 30 per cent in India, while in Singapore it is 17 per cent. In October 2014 Amazon’s main warehouse in the state of Karnataka was temporarily closed down after the state accused the company of tax evasion. The state claims that the goods in the Amazon warehouse are factually owned by Amazon and therefore taxable, while Amazon maintains that they just provide a storage service for the owners of the goods. The state needs to take part in the gold-rush, but the gold-rush does not seem to guarantee enough revenue for longer term infrastructural investment. Having so far mainly focused on the bubble-aspect of e-commerce, it can nevertheless not be ignored that these companies set-up a modern warehouses and delivery network, which employs a new generation of workers. We are not just waiting for the bubble to burst, but hope that workers’ struggles arise, which turn this vast structure of exploitation into a global network of unrest. Flipkart has currently 17 bigger warehouses in India, covering 1.5 million square feet of storage capacity. For example, workers in the recently opened ‘fulfilment centre’ – Newspeak! – in Luhari, which is close to Gurgaon, store and supply consumer electronics and durables to the northern parts of the country – Delhi, Haryana, Rajasthan, Punjab and Madhya Pradesh – which is a very extensive catchment area. Amazon has 12 central warehouses (total 2.5 million square feet) some of them owned and run by outsourced logistics companies, e.g. Patel Logistics. Amazon’s largest Indian warehouse in Hyderabad, is 280,000 square feet, which is roughly a quarter that of Amazon’s US warehouses. In these warehouses the average workforce ranges between 600 and 1,200 workers. From these central warehouses, goods are delivered to smaller distribution centre. In towns like Mumbai or Delhi, Flipkart and Amazon run around 15 to 20 of these smaller delivery points, where between 60 to 150 workers sort the deliveries. Flipkart and Amazon make use of their own transport fleet (in Flipkart’s case through the subsidiary e-kart), outsourced delivery services and self-employed couriers. Amazon is said to handle as much as 55 percent of its Indian deliveries on its own, which is very different from the situation in Europe or the US. Most of the end-delivery to the customers or pick-up points (often internet cafes) is done by motorcycle couriers; Amazon alone employs more than 4,800 motorcycle workers across India. The delivery drivers for Flipkart in Okhla (Delhi) own their van or lease it. They are paid Rs 22,000 monthly for the contract, but they have to bear all costs for the vehicle. They have to pay Rs 6,000 for gas alone. The situation is similar for the DHL drivers: they are driving a subcontracted truck, their boss might own between 1 and 20 trucks, they are paid Rs 15,000 per month, they work 12 hours a day, six days a week. Around 60 km south of Delhi close to the major industrial area IMT Manesar and the national highway 8 a new logistics cluster has emerged. We spoke to workers from three different warehouses. The warehouse was opened in 2014, situated around 32km from Gurgaon, 12km from the National Highway 8. It is fairly isolated, the next smaller ‘town’, Tauru, is about 2km away. A local farmer said that the land was bought five years ago, for Rs 1.3 crore (13 million) per acre; land prices in the area are now around 4 crore. 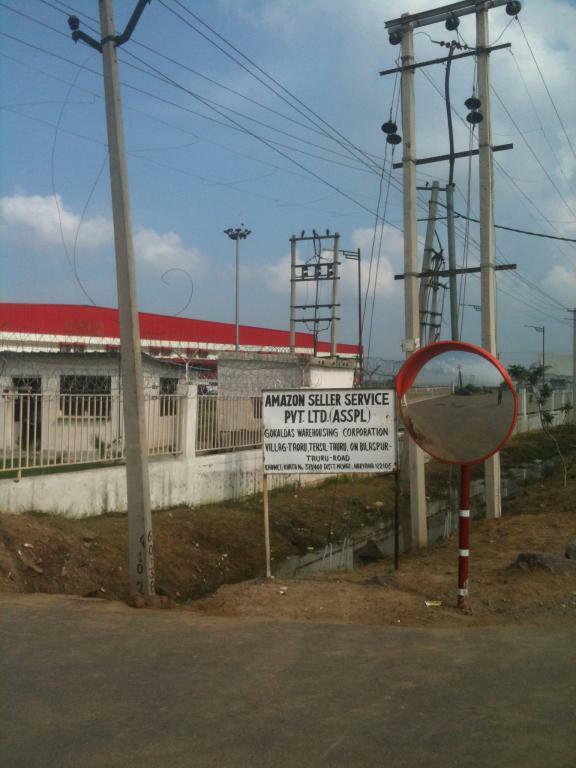 The company who owns and runs the warehouse for Amazon is Amazon Sellers Services Pvt. Ltd. / Gokaldas Warehousing Corporation. This seems to be a company based in Gujarat, which also manages the Amazon warehouse in Bangalore. Another bigger FedEx warehouse is 1km away. Most workers arrive in buses, 16 buses per shift. There are two 10-hour shifts per day. Shifts change at 7pm. The warehouse supplies smaller distribution centres, not customers directly. Workers said that up to 50,000 items are handled per shift. All kind of trucks, vans and motorcycle couriers come to deliver stuff to the warehouse. A small truck with garments came directly from the factory in Ludhiana, a ten-hour drive. A small van came from NOIDA, around 70km away, with parcels sent through Edata Ventures Ltd., which is another e-commerce company, mainly dealing with electronic gadgets, but also nutritional supplements. A motorcycle courier came with a big bag of stuff from Delhi, employed through the courier company Blue Dart, but Amazon rejected the delivery because the Minimal Retail Price label was not given on the commodities. In total there were around 1,600 workers, out of which 300 to 400 are hired by Amazon Seller Services directly. Those directly employed comprised mainly of management. The warehouse workers are hired through two contractors, one of them Om Enterprises. Om Enterprises also hires workers for nearby Myntra (Binola) and Flipkart (Bilaspur) warehouses. The 70 housekeeping workers are hired through the contractor, Spiffy. According to the workers we spoke to, there are female workers employed, also on the shopfloor as pickers. While the male shift finishes at 7:30pm, the women workers finish at 6:30pm. Warehouse workers’ wages are Rs 8,500 per month, five working days per week, 10-hour shifts. There are two tea breaks of 15 min and one lunch break of 30 min. There is a canteen, food is expensive, one thali Rs 50. According to workers employed in the photo-studio department, overtime is paid triple rate, which means Rs 115 per hour. There is not much overtime though. The housekeeping workers take care of the premises (gardening) and cleaning inside the warehouse. They earn Rs 7,500 and have only four days off per month. Many sellers don’t have the means to provide professional photography of products for the website. So Amazon has built studios inside its warehouses to snap those images for them. The manager of the photo-studio department is supposed to earn Rs 250,000 per month. There workers have to take pictures of each item which is sold through Amazon and upload pictures and descriptions onto the Amazon website. Around 40 workers are employed in the department, only on day-shifts. They get one year contracts, which then have to be renewed. The pickers in the picking department have scanners; one worker said that they can see the productivity target time on the scanner, but that is not confirmed. One worker said the target is 150 to 200 items per hour, another worker said 60. If targets are not met workers have to go to a ‘feedback session’ with management. You can have three feedbacks in two months, then you are out. In the packaging department the hourly target is 60 items. We handed out leaflets to workers who came out after shift (most workers leave in buses from the company premises, so there is no chance to talk). The leaflet described the situation of warehouse workers in Europe. A group of 20 – 30 workers gathered. Many were pissed off with the low wages and the fact that wages were not increased after a year. (“We should earn at least Rs 20 to 30,000 per month for the hard work we are doing”). People were also pissed off with the increasing workload. In packaging the work pressure is constant, no relief during the shift. A security guard asked us not to stand in front of the company. When we moved on and re-gathered around 50 metres away, he followed us and repeated that we should move on. A manager also arrived and shouted “Associates, move on!”. We told workers about the strikes at Amazon in Germany and the organising in Poland and left our contact details. The Amazon FC in Mohan estate opened in May 2015. Goods arrive from Taoru and are delivered to smaller distribution centres. Unlike the warehouse in Taoru it seems that Amazon runs this FC directly. There are around 250 workers. Two of the managers we spoke to had worked in Taoru before; they commuted daily from Delhi, which is between 2 and 3 hours each way. Amazon uses G4S security guards and 22 Sodexo housekeeping workers. They are paid Rs 8,000. They said that there are packaging targets of 100 items per hour. The canteen is expensive, 40 to 60 Rs for a thali (meal). We met a young picking worker, he used to work for Myntra, he was paid Rs 9,000. He shifted the job because of better payment at Amazon, where he gets Rs 10,500 after ESI, PF is deducted [insurance]. He is a graduate (he studied to become a teacher). He does social work in the village back home in Uttar Pradesh, helping poorer kids to get an education. He was interested in the organising efforts at Amazon in Germany and Poland. Many of the warehouse workers and delivery drivers have a higher level of education. Apart from the Amazon FC there are more than 15 smaller delivery warehouses of different forms in Okhla, each with around 40-60 delivery staff. Most of the delivery staff is between the ages of 18 and 28, earning Rs 10,000-15,000 a month, with one weekly day off. Myntra is the biggest e-commerce fashion company and has been recently taken over by Flipkart. It sells branded stuff (Nike etc.) to mainly middle-class customers. The warehouse was opened in Gurgaon around three years ago and shifted to Binola one year ago. Most workers started work there after the move. It is one of the main ‘hubs’ of Myntra; there is another major hub in Bangalore. It supplies ‘distribution centres’ in North India, e.g. to Mahipalpur in Delhi, from where customer deliveries take place. Myntra uses its own logistics company for short-travel deliveries and ‘third party’ couriers, e.g. Blue Dart, for short and long distances. Around 40 per cent of deliveries are done through ‘third party’ logistics companies. The fashion items in the warehouse are all ‘branded’ and partly come directly from the manufacturers. On average the warehouse processes 25 to 30,000 items per day, during peak-times up to 100,000. Myntra employs around 1,000 workers on three shifts, out of which 200 workers are directly hired through Myntra. The rest are hired through three, four different contractors – they hire people aggressively in the warehouse sector. Those Myntra workers on the warehouse shopfloor are paid the same wages and they do the same work as the workers hired through contractors. During peak times Myntra hires an additional batch of 100 to 200 workers through contractors. The company hires people with 10th and 12th class education, which means that warehouses and local factories employ a similar workforce. Many of the workers have worked in factories before. There are no female workers in the warehouse. The official working times are 6am to 3pm, 3pm to 9pm and 9pm to 6am – three rotating shifts. There used to be two tea breaks of 15 min each plus 30 min lunch break, but one tea break was cut this year. Departments take their breaks at different times. During peak times the company orders overtime, employing people on two 12-hour shifts. Then there are no days off, workers work seven days per week. This is not too frequent, on average there is 10 to 25 hours of overtime per month. The company pays double rate as per the law. The people in logistics and quality control were only paid their overtime after three months and only after making trouble. Fashion items are unloaded and placed on locations by the ‘inventory’ workers. From there pickers pick the items, They have modern scanners. Quality controllers used to check the actual fashion items, e.g. garments for flaws, but this has changed. Now quality control means that the packaging and the correct destination is checked. There are around 140 tables for quality checkers, but usually only half of them are used. The quality controllers used to be able to sit down during work, this has changed, as well. After the quality control, the ‘logistics’ department sorts the items into destinations and for ‘Myntra logistics’ and ‘third party’ logistics and pack the items into bigger transportation bags, which weigh between 10 and 20 kg. Apart from the pickers most workers use the computer system during work, e.g. to check the destination of an item or to register rejections. Workers used to be trained on different jobs, now they largely stay in their respective departments. The pickers have direct targets of how many items to pick per hour, around 120 items, so have the workers doing the packaging, around 65 items. Management announces over the loudspeaker system if pickers are too slow, they call out the worker’s name and company ID. They only occasionally print out a list with the achieved productivity. In the other departments there are no direct targets. Management says that workers are only allowed to finish work once their daily target is met, but usually workers leave on time, whether the target is met or not. Workers have heard about conditions in the nearby Amazon warehouse, where the work pressure is supposed to be higher, but so are the wages, around Rs 12 to 14,000 for quality checkers. The fact that the warehouses pay Rs 1,000 per month more than many manufacturing companies is a reason to work there. The workers in Binola had not heard about the Flipkart/Myntra delivery workers’ strike in Bombay that was happening at the time. The warehouse is one of the main hubs of Flipkart, no direct deliveries take place, but supplying of the local distribution centres. According to a ‘local village guy’ who runs a labour contracting business and supplies labour to Flipkart, the warehouse was opened around three years ago. Flipkart has bought local land, but hasn’t invested in the road leading to the warehouse, which is a dirt road. There is a factory next to the warehouse, Bharat Seats, manufacturing seat parts for Maruti Suzuki. Flipkart employs around 1,200 workers, through three different contractors. The guy we spoke to supplies 100 workers to Flipkart, and more workers to Zara/H&M and Amazon nearby. He has a small office close to the Flipkart warehouse and an office space in the Amazon canteen. He said that Flipkart engages three different contractors in order to undermine the possibility to create a union and to shift work from one contractor to the other as a disciplinary measure. He says that many workers live in the area nearby, rents are around Rs 1,500 per room per month. Workers we met said that the warehouse processes around 18,000 items per day, more during Diwali peak-time. Items span from books to laptops. Pickers have targets of 60 to 70 items per hour: they use scanners and pick-lists on paper. On pick-list contains around 10 to 15 items, then the trolley is returned to the packaging department. Their targets are also between 60 and 100 items per hour. Wages are Rs 7,000 to 8,000 per month, based on 10-hour shifts. No female workers are employed. We are sure that a lot of informal discontent is brewing and collective steps are taken. Below just two examples of two current official disputes in the sector. While we were talking to warehouse workers in Delhi, Flipkart delivery drivers and sorting workers in Mumbai went on strike. Unfortunately we were not able to get first-hand information about the dispute, which equally unfortunately was officially represented by the Hindu-nationalist trade union Maharashtra Navnirman Kamgar Sena (MNS). Delivery workers are paid a fixed amount for phone bills and petrol costs, which often does not cover their actual expenses. Working times often exceed 12 hours. They are made responsible for damages and in case their goods get stolen. Many of them have no accident cover or health insurance. Industry bosses say that the e-commerce sector in India will need an additional 45,000 bike workers over the next six months (second half of 2015), so some delivery companies offer credit schemes when recruiting workers, so that they can purchase their own motorbikes. On 27th of July 2015 the press reported that over 400 delivery workers and shipment sorters working in six delivery centres of eKart (Myntra and Flipkart logistics wing) have gone on strike, leaving thousands of shipments undelivered. They demand amongst others, uniforms, toilet facilities, extra-bonus for certain deliveries, health insurance. Another eKart employee reveals they typically end their day at 10pm. Kumar (name changed) is not striking because he fears repercussions. “I met with an accident on the job, had nine stitches and was recovering at home for a month but didn’t get paid for it,” he says. The heat can make you dizzy on a bike, Kumar says. “It’s a little better delivering in a van, but they’ve raised our monthly target from 700 to 1,000 packages, after which incentives apply,” he says. With the earlier target, Kumar did make Rs 1,500 to 1,700 extra in busy months, but the new target looks tough. On 31st of July a scheduled meeting between management and trade union leaders did not take place, the union blamed management for not attending. The police were called after the workers gathered at Flipkart’s Andheri office. A new meeting was scheduled for the 4th of August. On the 4th of August workers and union leaders turned up at the company office. When they found out that none of the Flipkart representatives of management were on site they encircled the building for an hour, locking in the Mumbai office in-charge. While leaving, the union leaders announced that officials would meet MNS chief Raj Thackeray next Tuesday. They said that the officials have agreed to recognise their union. We don’t know about the outcome of the dispute. DHL has started investing into modern logistics infrastructure in India, in particular in the north. They try to keep the unions out by declaring that their delivery workers have ‘management status’ and are therefore not ‘workmen’ and can’t form trade unions. “The crux of the dispute in DHL is the right to association and right to collective bargaining by field couriers in Hay grade (low-level management grades). It all started in 2004, when DHL surreptitiously started transferring couriers in workmen grades into Hay grade,” says N Vasudhevan, president of the DHL Employees Union. The discontent of workers within the newly developed software departments, warehouse clusters and delivery networks rips apart the facade of the sanitised and effortless world of online services.